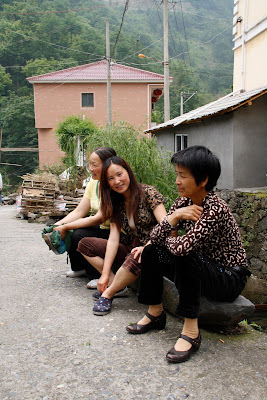 On our second day in Nine Dragon Valley we took a long ramble to a local village nearby. Leaving the small township of Nine Dragon Valley and a two-lane road behind, we walked gradually uphill along smaller and smaller roads through beautiful tea and farming countryside. The sun was shining, the shrubs were full of butterflies, the wildflowers were in full bloom, and beside the small road flowed a tiny creek. It was about as far from downtown as you can get. For a while I didn't even hear a single horn, but horn-honking is not restricted to Shanghai, it's a national characteristic. Sure enough, before long a small goods truck laden with rocks for a building project came honking his way loudly and frequently down the road, just in case we hadn't seen him. It was a straight stretch, with a clear view of 500m, but it would be really bad luck and a lot of police bother to hit a bunch of foreigners, so he was taking no chances. Almost at the village, we passed by a group of workmen having lunch in the shade by the roadside. Seeing our hot faces they stood and offered their seats, and a glass of the local white tea. 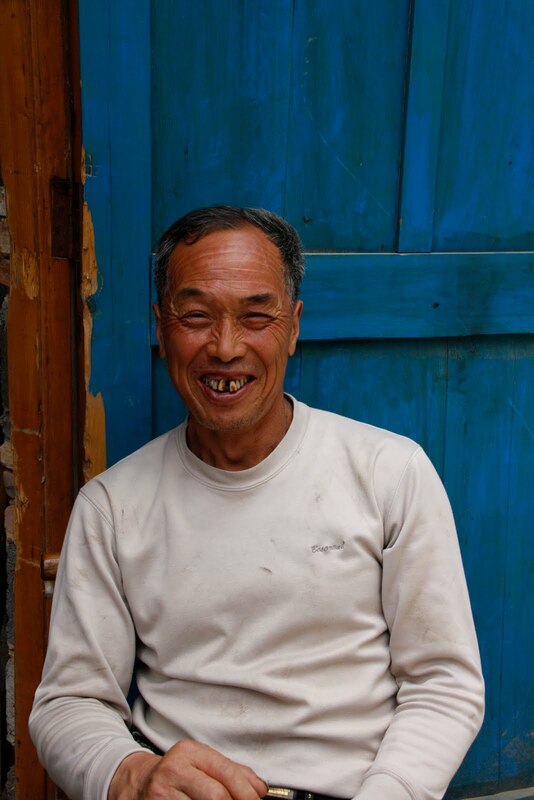 This kind of open hospitality is one of the best things about living in China - the people are genuinely welcoming of foreigners of all guises. 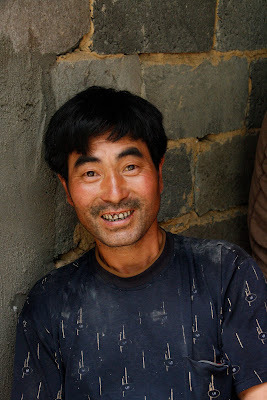 The workmen had weathered skin the colour of chestnuts from working all day outdoors, and they were wiry and strong. They had heard that Australia was big, but that was the limit of their understanding of a place so foreign and far away, so we chatted while we rested about the house they had been employed to build. It would have air-conditioning, I was told, which would make it easily the fanciest house in the village. We thanked them for their kindness and kept walking, passing their country wheelbarrow with its bicycle tyres and their bamboo work-ladder. At last we came to the village itself, high up at the head of a valley. 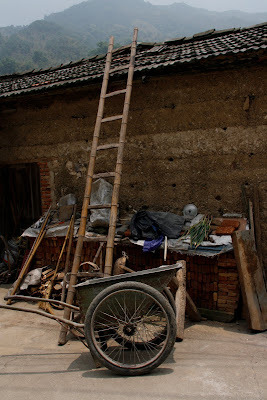 There was an old three storey schoolhouse, maybe from the 1950s, but now abandoned in favour of the larger, newer school in Anji township, a 15 minute drive away. Not to be wasted though, the schoolhouse had been turned over to all manner of useful activities - grain was being stored there, the local drunk had taken up residence in a corner, and a lot of washing was being dried on its covered balconies. On the ground floor a woman was cooking a communal lunch for many of the locals in an enormous wok. 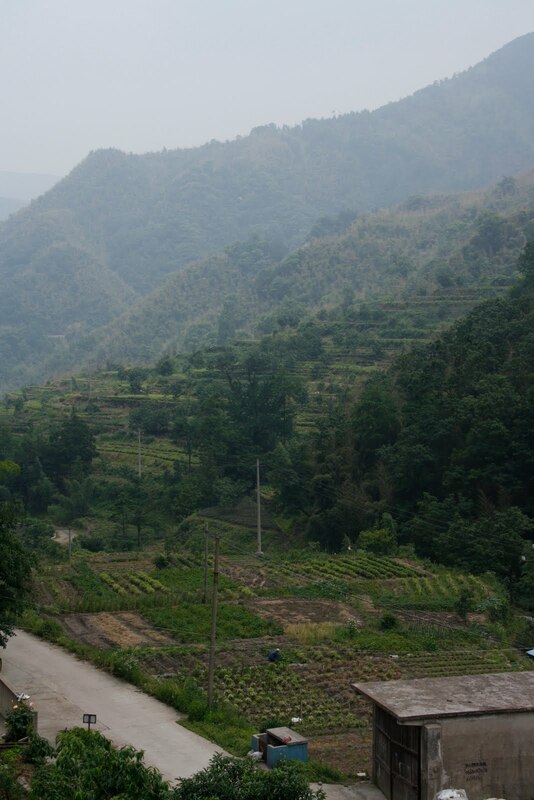 We climbed up through the washing to the roof, for a fantastic view - a panorama of the whole valley, vegetable plots, rows of tea, and stands of bamboo. 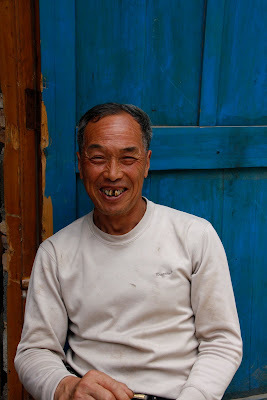 The villagers were surprised to see so many foreigners in one place, but they smiled a lot and tried to work out why on earth we would have an interest in their end-of-the-road village. They were all hoping to move on to bigger and better things, like everyone else in small villages all over the country. Shanghai is full of people from villages just like this one, working as odd jobs men and garbage recyclers, waitresses and cleaners. 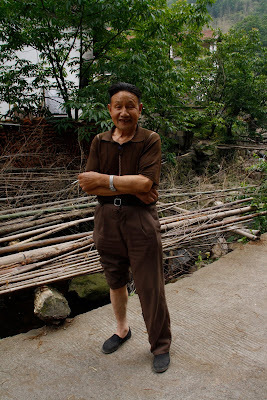 It's hard to imagine they could like Shanghai better than this idyllic rural spot, but I was told the winters here are so harsh the water pipes freeze and they have to chip ice to melt for drinking water, and that there are frequent power cuts and no heating. Not so idyllic after all, but very beautiful nonetheless to our ignorant eyes.